Brand: Britax Child Safety, Inc.
Certain ClickTight model convertible car seats may contain a defect with the harness adjuster button, which would pose a safety hazard. The harness adjuster button may remain down in the "release" position after the harness is tightened. This will enable the shoulder harnesses to loosen from a child's movements while secured in the seat. A loose harness may not adequately protect a child in the event of a motor vehicle crash. The recall includes certain Advocate ClickTight, Boulevard ClickTight, and Marathon ClickTight model convertible car seats manufactured between August 1, 2014 - July 29, 2015 with the following US model numbers: E9LT95Q, E9LT95Z, E9LT95N, E1A025Q, E9LT86F, E1A135Q, E9LT86G, E9LT85Q, E9LT86A, E9LT86H, E9LT85S, E1A015Q, E1A016A, E1A016H, E1A166F, E9LT87J, E1A116L, E9LT76P, E9LT71Q, E9LT76N, E9LT76B, E9LT75R, E9LT76L, E1A006B, E1A005R. 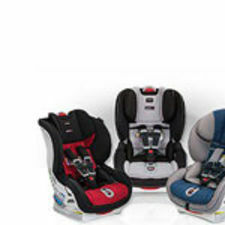 Britax is automatically mailing a free remedy kit to all registered owners of the recalled car seats within 7-10 business days of the announcement.